Spray 3 1/2- or 4-quart slow cooker with cooking spray. Add broth, brown sugar, soy sauce, chili garlic sauce and gingerroot to slow cooker; stir with whisk to combine. Stir in green onion whites. Reserve green onion greens for garnishing; cover and refrigerate until ready to use. Add roast to slow cooker; turn to coat. Cover; cook on Low heat setting 8 to 9 hours or until very tender. Transfer roast to cutting board. Cool slightly; cut or shred, and return to mixture in slow cooker. Increase to High heat setting. In small bowl, beat cornstarch and cold water. Quickly stir into liquid mixture in slow cooker. Cover; cook 5 to 10 minutes or until thickened. Divide rice among 8 bowls. 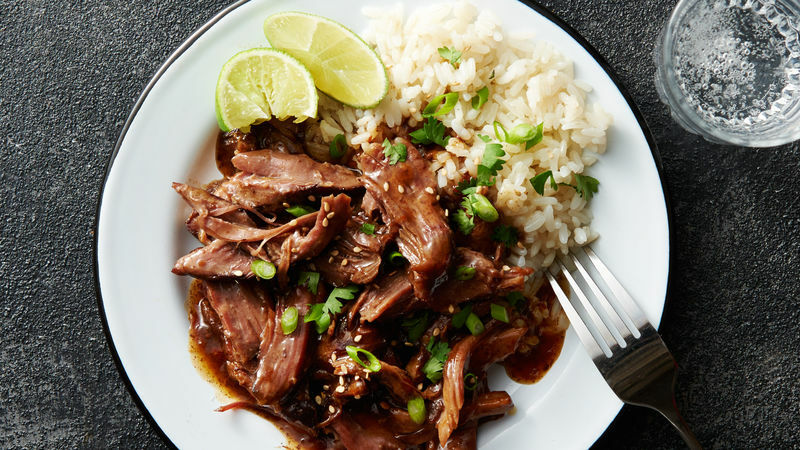 Divide shredded beef among bowls of rice. Top with reserved green onion greens, cilantro and sesame seed; serve with lime wedges. Serve with steamed, salted Cascadian Farm™ edamame to round out this Japanese-inspired meal. Keep microwavable frozen cooked rice on hand to shave off a few more precious pre-dinner minutes.